Could Waterloo International Become A Greenhouse? Dean Nicholas Could Waterloo International Become A Greenhouse? Word reaches us via @hughpearman of a proposal to turn the mothballed former Eurostar platforms at Waterloo station into a green space. 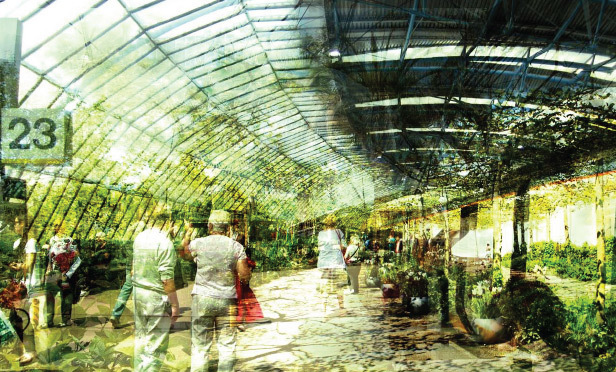 The plan comes courtesy of The Land Trust and Free Architecture, and would require no structural change to Nicholas Grimshaw's trainshed, which closed five years ago. 99 railway carriages would be parked along the platforms and converted for use as allotments, a farmers' market, street food stalls and more. The space, described as a "ready-made greenhouse", would be turned into "an English country garden in the city all year round." You can read further details on The Land Trust's website. The project was entered into the High Line for London Green Infrastructure Ideas Competition, but the judges weren't impressed and chose not to shortlist it. Nor would Network Rail be in favour: the first of the disused platforms is scheduled to re-open in 2014.